My name is Michelle, in April 2007 I unfortunately suffered a Stroke. Being in hospital you can feel isolated and alone especially if you suffer from a Stroke. The hospital staff all worked hard to brighten my spirits, but they were very busy. Then I discovered Radio Hillingdon FREE on channel 45 on my bedside Hospedia unit. I really enjoyed the variety of music and local news. Over the following weeks I looked forward to the Radio Volunteers visiting me to ask me what music I would like played on the Request Show. 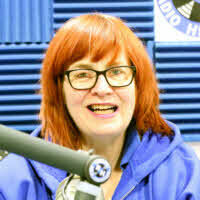 In October 2007 I volunteered to join Radio Hillingdon as a presenter. After a comprehensive training programme, I have never looked back. I really do enjoy presenting my own Thursday Evening programme. So I'm inviting everyone to Listen. If you are motivated by music & enjoy a friendly atmosphere why not JOIN US as a member.